John Deer’s Embroidery Legacy is an official re-seller of Hatch embroidery software. We’re here to help you turn your embroidery dream into reality. Use the code: DEER19 at checkout while purchasing on Wilcom’s site & receive our amazing exclusive bonuses! Exclusive Bonuses: Including additional ESA fonts, monograms & elements (which you choose yourself from the world’s largest database of over 625 ESA fonts), embroidery designs (choose from over 26,000) and more! See which bonuses come with which Hatch product below. Professional Hatch Education: Taught by John Deer, the world’s most awarded embroidery digitizer for over two decades… Because why not learn from the best? Access to our “Hatch Facts” Online Community: With over 3000 members, we run one of the world’s largest interactive Hatch group on the internet. Superior Customer Support: We’ll hold your hand every step of the way. 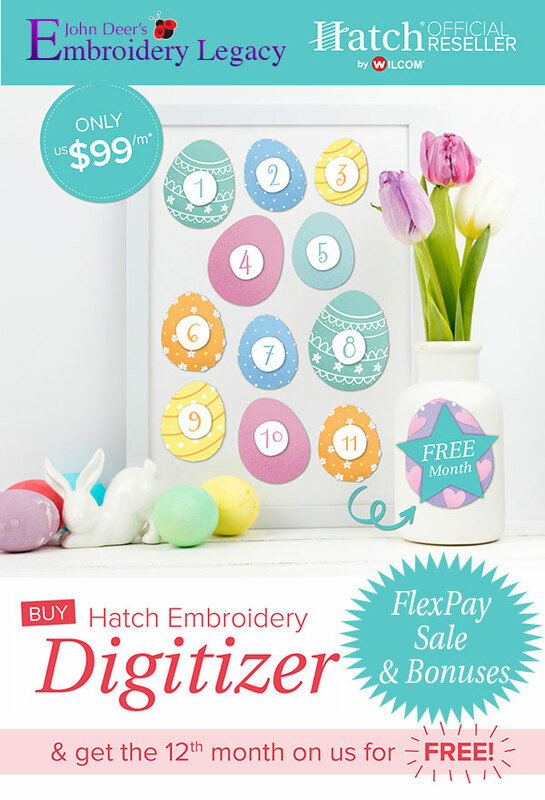 Hatch Digitizer Easter Flexpay Special! Purchase Hatch Digitizer through us using Flexpay before April 30th & receive the 12th month free PLUS our amazing Digitizer bonuses! Simply select “John Deer” as your reseller & use our reseller code DEER19 while checking out on Wilcom’s website. See Wilcom’s site for full terms & conditions. 2 free guided video tutorials: “Welcome to Hatch” ($19.95) & “ESA Lettering and Monograms” ($4.95). 2 free Hatch lessons “Auto-Digitizing” ($19.95) And “Manual Digitizing” ($19.95). Which both include fun projects. How Do We Ensure Your Success After You Purchase? Using amazing software is only half the battle. The other half is knowing HOW to use it. Here at Digitizing Made Easy we provide you with numerous tools to ensure you’ll get the results you’re looking for with Hatch. You’ll be creating & editing your own designs in no time! Access to our Hatch Facts Online Facebook Community: Share information, ask questions, share projects & become inspired by over 3000 other Hatch users & expert group monitors. Live Support: Access to a toll-free number, support-ticket system & help via email. No matter how you like to communicate, we’ve got you covered! Use the code: DEER19 at checkout & receive our amazing exclusive bonuses.